With the recent influx of "Big box" and "mega store" style shopping experiences, malls and mini malls are becoming extinct. The "Big box" stores like Dicks and Walmart are not the only culprit for putting the strangle hold on mall style shopping, consumer habits, and location have an impact also. Consumers today don't necessarily want quality or originality when they shop anymore. They are becoming C.F.L. shoppers. C.F.L. shoppers want cheap, free, or less. You can get this from Walmart, Target, and Best buy type stores. Many beautiful malls in the world that where once filled with high end/original merchandise stores are being replaced by discount stores and dollar stores. That being said Allcoolshit would like to introduce you to Deadmalls.com a great concept brought to you by retail historians, Peter Blackbird and Brian Florence. Deadmalls started as a hobby and turned into a web site that features "dead malls" all over the USA and parts of Canada. 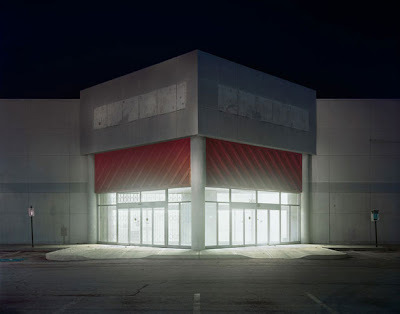 A "dead mall" is a mall that for the reasons discussed above or some other circumstance has simply started to fail and begins to lack customers, tenants, or has shut down completely and been left abandoned. The guys at Deadmalls.com gather the info on the abandoned malls by either travelling there themselves to document, or submissions by viewers. They offer histories of the malls, opinions of the malls downfall, and sometimes pictures and videos of the malls.